eCommerce websites will always have carts abandoned before a shopper completes a purchase. Not all retailers are acting on preventing and recovering those lonely shopping carts, but it a great source of income if handled correctly. A key factor is to choose the best abandoned cart recovery software. The shopping cart tool that includes the features needed. 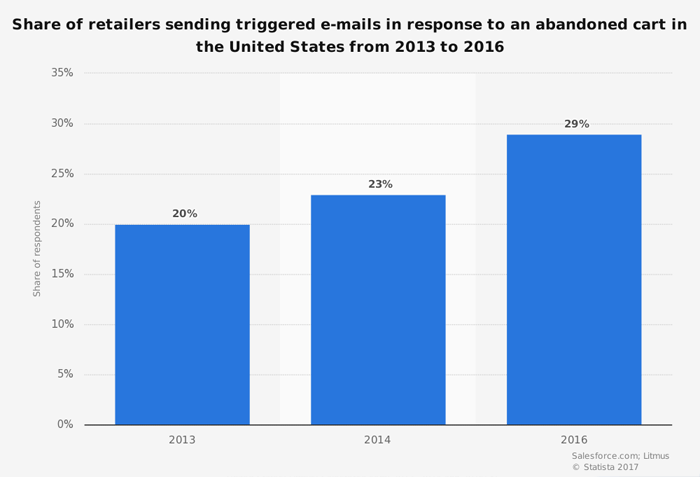 Below is a chart showing the percentage of ecommerce sites sending triggered email when responding to an abandoned cart. The average website loses 69% of shoppers who don’t complete their purchase after adding first items to their shopping cart. 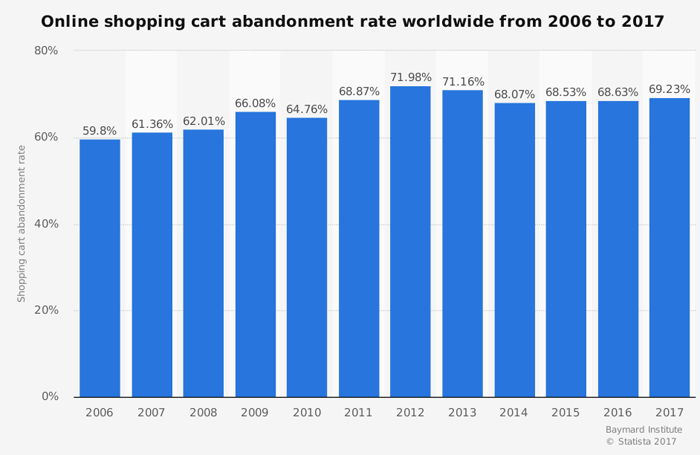 Below are the online shopping cart abandonment statistics from 2006 to 2017. Cart abandonment software helps ecommerce sites and marketers to re-engage these potential shoppers and help them complete their purchase. A good start is to lower the number of abandoned carts, even before they get abandoned. Stick to these best practices below. Good to know before you start is that some of these will ask functionality that is available through your cart recovery software, others are site setting or based on your offers. 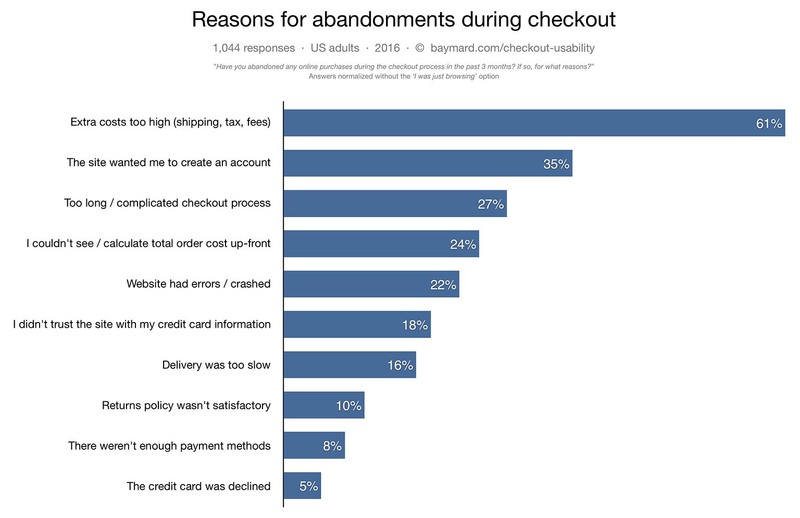 When possible, offer free shipping – over 60% of abandonment occurs because of unexpected shipping costs. Make sure to prevent surprises, follow the rule of “what you see is what you get”. Ask for the email early so if a cart is abandoned you can communicate. Many users will want to save their cart for later. Make sure to offer this option and make sure it is visible. Offer guest checkout. Reduce friction and do not make them register. Checkout process should be easy and fast. Offer an easy contact option. Show your website is secured. Collect payments in various ways. Use the option of social proof & items left to help shoppers buy. Shoppers love to see others looking at the same products and to know how many items left. This is the most important one. Use exit intent popup, although they do not prevent abandonment this is a crucial tool for recovery. Completely preventing abandoned carts is not possible, you have to take into account which reasons there are so the next step is to implement the best cart recovery solution that totally fits your needs. But what features should you be looking for, to find the Best abandonned cart software? We always look at the following. Ability to send emails to your abandoners quickly. Most recovered carts will be recovered within hours from time of abandonment. Ability to send a series of emails based on business rules. A-B testing capabilities. Test to improve conversion rates. We saw cart recovery campaigns start at 10% conversion rate and end up converting at 25%! Ability to design your email and email content through an easy email builder. Includes actionable reports and measures the results of your abandoned cart recovery. Ability to inject items that were abandoned into the abandoned cart email. To conclude, there are plenty of abandoned cart software systems you can choose from. Follow the recommendations above and set you goals. Sometimes there are special If there are unique features that are needed many of the recommended solutions will work with you to get them.